OSIRIS-REx blasted off from Cape Canaveral on September 8, being sent on its way by an Atlas V rocket in a flawless one-hour ascent mission. Completing its first steps in space, the spacecraft set sail on a long journey of seven years comprised of a two-year link-up with the asteroid, a three-year stay to study and sample Bennu, and a two-year return trip to deliver up to two Kilograms of material from the asteroid’s surface. Within minutes of separating from its carrier rocket, OSIRIS-REx headed into a multi-week campaign dedicated to checkouts and reconfigurations beginning with the critical deployment of the craft’s solar arrays. 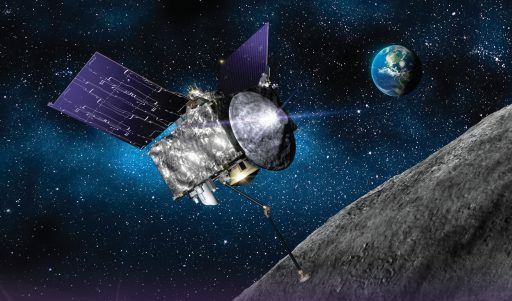 Talking to the spacecraft via NASA’s Deep Space Network, controllers verified that OSIRIS-REx was healthy, charging its batteries and actively maintaining its attitude. Two days of extensive checkouts of the spacecraft platform’s core systems were completed before OSIRIS-REx was transitioned from an initial Safe Mode into its Outbound Cruise Mode, also marking a major attitude control system transition from inertial pointing to a Sun-Earth Pointed orientation. 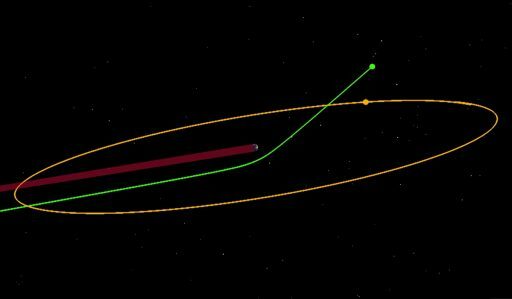 By the end of September 11, OSIRIS-REx had departed Earth’s Sphere of Influence with the sun now the primary body with respect to gravitational forces acting upon it. 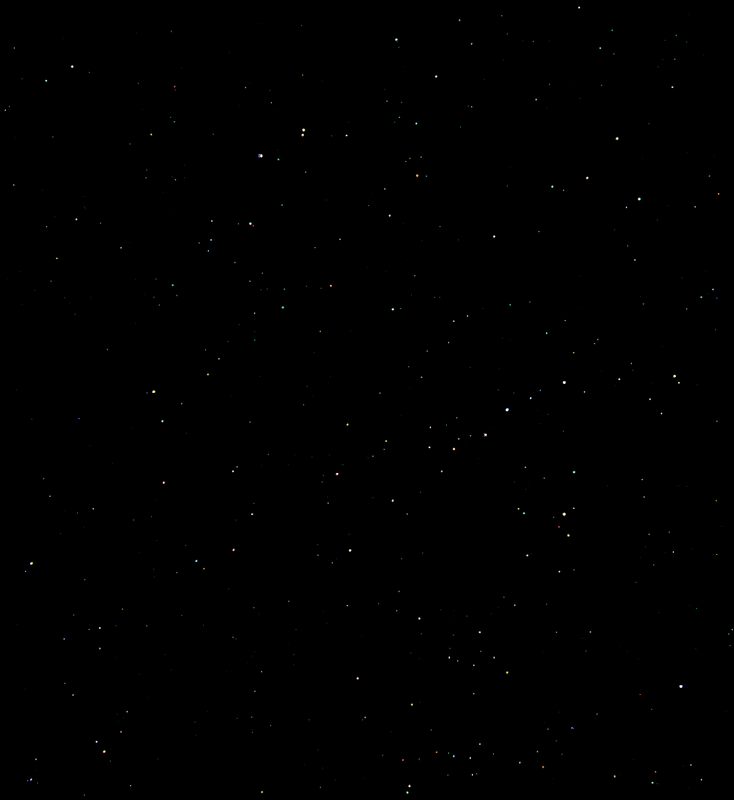 To verify the operation of the spacecraft’s Star Trackers, teams downlinked an image from one of the trackers on September 12. 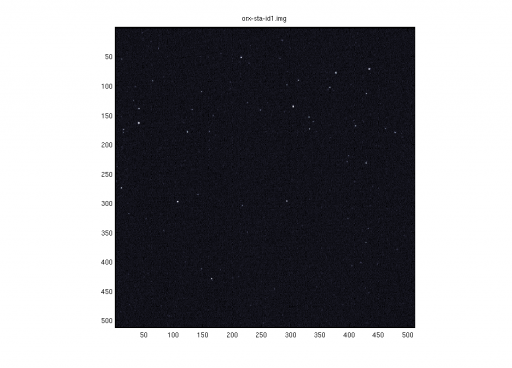 Normally, Star Tracker images are analyzed on board and not sent to the ground, but that function is available for testing purposes. Ranging of the spacecraft provided a precise fix on its outbound trajectory, showing Atlas V performed a very precise injection with no need for any immediate correction maneuvers. Over the course of the next week, teams powered up the OSIRIS-REx instrument suite for basic electrical and functional checks to ensure all payloads made it through launch in good health. OCAMS – the OSIRIS-REx Camera Suite – saw first light on September 17, delivering images of a star field in Taurus, near the constellation Orion. 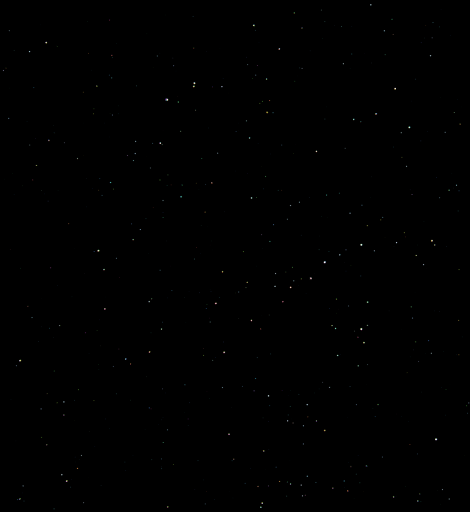 These images showcase the differences between the different OCAMS components with MapCam delivering a wide field of the star field and PolyCam covering only a narrow corridor but capturing many faint stars MapCam can not detect. 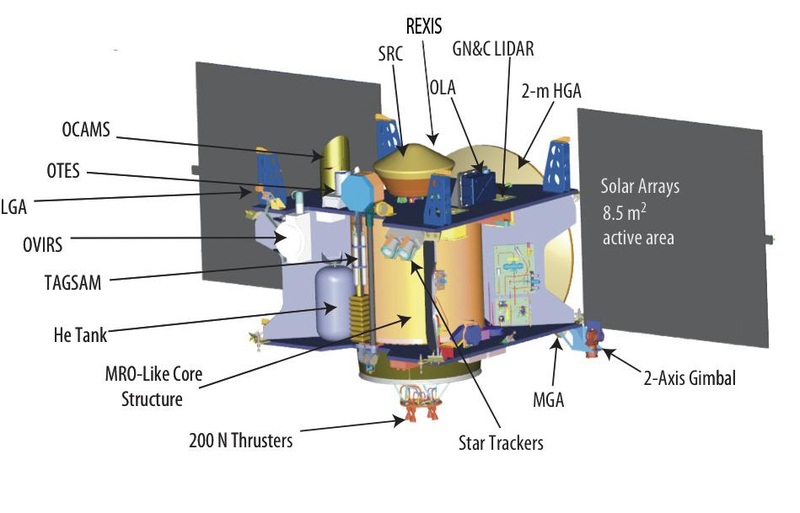 At the asteroid, PolyCam will be in use for long-range imaging on approach and ultra-close-ups when in orbit while MapCam delivers global imagery of Bennu. 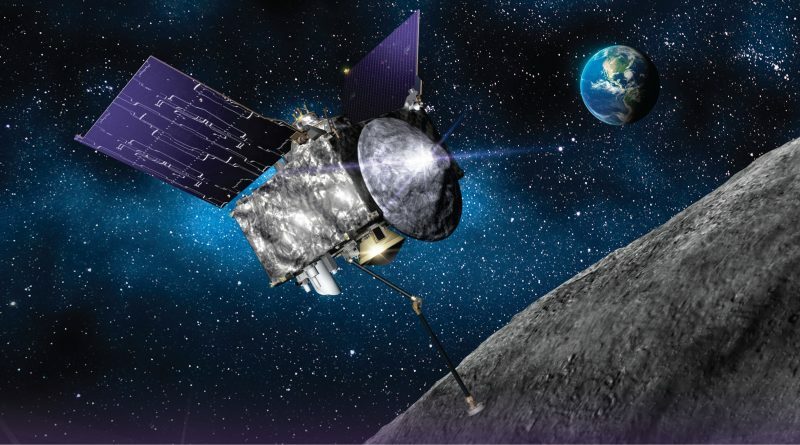 Next to be powered up was the OSIRIS-REx Laser Altimeter that went through test sequences and performed a test firing of its laser that will be put to use for detailed topographic measurements of the asteroid. The Visible & Infrared, and Thermal Infrared Spectrometers known as OVIRS and OTES were separately powered for testing and both showed excellent instrument performance. REXIS – the sole student-built instrument of the mission – checked off its functional tests without problems and is ready to study the asteroid in X-ray vision. 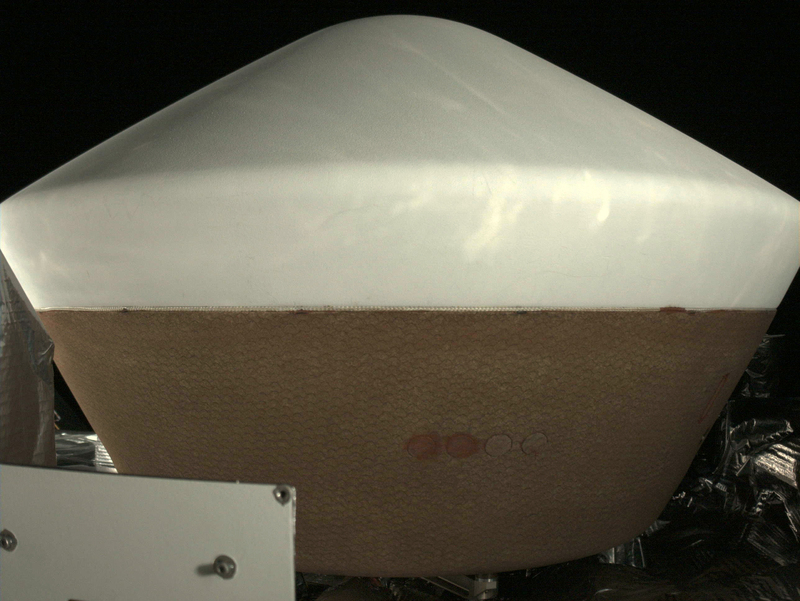 The activation of the Touch and Go Camera System (TAGCAMS) and its checkout yielded a photo of the spacecraft’s Sample Return Capsule that is set for a long ride to asteroid Bennu and back ahead of a speedy re-entry to deliver the mission’s sample to Earth for laboratory analysis. The camera pointed at the capsule, known as StowCam, will have the important task of documenting the handoff between the TAGSAM sampling arm and the capsule, ensuring the sample canister is secured in place inside the capsule before releasing the arm and closing the capsule. Last Friday, OSIRIS-REx executed its first Trajectory Correction Maneuver (TCM) that was primarily dedicated to testing the Trajectory Control System thrusters, six of which are installed on the spacecraft. The maneuver changed the spacecraft’s speed by 0.5 meters per second and lasted only 12 seconds, providing valuable data on the operation of the engines was well as the spacecraft in the attitude control mode selected for engine firings. Originally, TCM-1 was budgeted with 11 Kilograms of propellant to change the spacecraft’s velocity by up to 11.6 meters per second to correct any insertion errors by Atlas V. With a very accurate injection, OSIRIS-REx only consumed 0.5kg of Hydrazine, adding to the mission’s propellant margin and increasing the flexibility of operations at the target asteroid. OSIRIS-REx hosts a sophisticated propulsion system with four different types of thrusters – six 22-Newton TCM Thrusters used on Friday, 16 Attitude Control Thrusters in use since separation from the Atlas V, a pair of Low Thrust Reaction Engine Assembly (LTR) thrusters to be used for the asteroid sampling, and four large 275N main engines that will come into play for the first time in December. In the near-term, the OSIRIS-REx mission team will begin preparing for the critical Deep Space Maneuvers in December that will set the spacecraft on a course for its September 2017 Earth Gravity Assist Flyby. 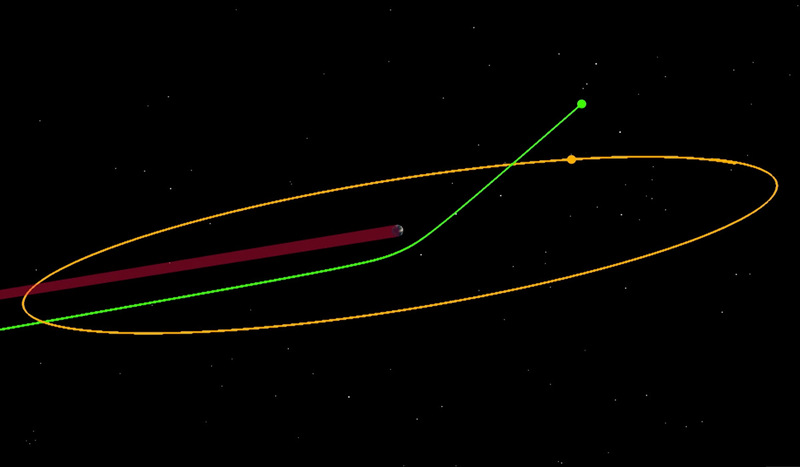 The Flyby is needed to bend the spacecraft’s trajectory to match the inclination of Bennu’s orbit ahead of a mid-2018 link-up. The Earth Flyby also provides an opportunity to exercise the mission’s instruments, verifying their performance in the known near-Earth environment where communications delay is not an issue. Visiting a carbon-rich asteroid is a top priority for scientists since asteroids are considered relics from the early stage of the Solar System, carrying a record of the conditions 4.5 billion years ago and possibly holding clues that could reveal how the building blocks for life were delivered to Earth and, possibly, other places in the Solar System. Bennu, the mission’s target asteroid, is a dark, unexplored world roaming the inner solar system in an orbit taking 1.2 years for one lap around the sun. The primary goal of the mission is to collect a surface sample from asteroid Bennu, and return as much as two Kilograms of material to Earth in a pristine Sample Return Capsule. Obtaining an untouched sample from Bennu and putting it through laboratory tests not possible with spacecraft instruments will reveal ultra-trace amounts of organic compounds to help in understanding the origin of the ingredients for life as we now know it on Earth.